“Two Beautiful Ballerinas” Family Portrait Painting captured two young sisters showing off their Ballerina poses. Their Mother wanted a portrait painting of her beautiful daughters over a stone fireplace in her formal living room. As you open the door to her home the focal point over of the fireplace is this 40″X60″ pastel painting. The ceilings were very high about at about 13 feet so the portrait needed to take on a vertical composition painting. I invented the poses of each child along, with their ballerina costumes. My client loved shades of lavender so I created the sense of softness within the background of this delicate portrait painting by using my client’s favorite color. It was a great deal of fun working with these two sisters. They were very active and loves to dance and play. There were three sessions I met with them to get to know there personalities. 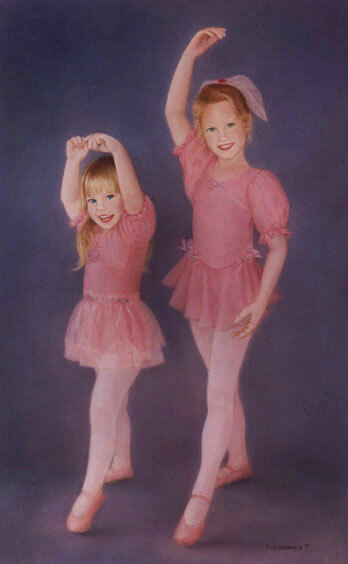 The older sister had this pink hair piece that she wanted in the portrait that gave me the inspiration to create the poses of the girls and design their costumes as “Two Beautiful Ballerinas”. It was a great time for all!! If you have any questions about this piece please contact me directly.